One of the melancholy duties we often face later in our lives is the clearance of parents’ homes after their death. I can scarcely believe that it has taken us nearly six months of weekly visits to sort through and process the contents of my late father-in-law’s house. This is the point when collectors of found photographs – Erik Kessels is one of the best known – sometimes swoop in and acquire albums of family pictures that get discarded for lack of takers. Kessels has used discoveries of this kind to generate a series of concept-driven photobooks, In Almost Every Picture. I wrote about a similar project from the Czech Republic in a recent column (‘Hole in the head’). That peculiar afterlife will not be the fate of my parents-in-law’s photos. As we dug through their possessions, it became apparent that there were even more pictures stashed away in the house than we had realised, mingled with other things in drawers, cupboards and wardrobes. One early task was to gather them all together and I cleared a tall shelf unit to become an overflowing repository for photo albums, scores of wallets of prints and negatives, hundreds of plastic boxes of 35mm slides, framed portraits and loose pictures collected in tins, as well as my father-in-law’s various cameras. Now fully revealed, this archive was so daunting that we left it untouched until the end of the long process and then realised we would have to take the photos home with us to begin sifting through them. The slides, mainly Kodachrome, date back to the early 1960s. Even with the aid of my old lightbox, prised out of storage for the purpose, it took many hours to go through thousands of images, deciding which to dispose of and which to keep, a task still unfinished. Mostly the pictures show family holidays in Europe – picturesque towns, beaches, harbours, the countryside, mountain views, beautiful old buildings – documented with relentless thoroughness by my father-in-law, a former senior civil servant, and a keen amateur photographer, who developed his own pictures in earlier days. As I reached the final boxes, I noticed one with the intriguing label ‘Rooms in house’ and this is what the slides show: all the rooms in the four-bedroom house (one was used as an office), with the exception of the downstairs cloakroom and the kitchen. The frames are date-stamped so we can see that the pictures, 42 in all, were taken on two days in July and August 2005 when my father-in-law was 76. We also have his Kodak projector and I put the slides in a carousel for a closer look. 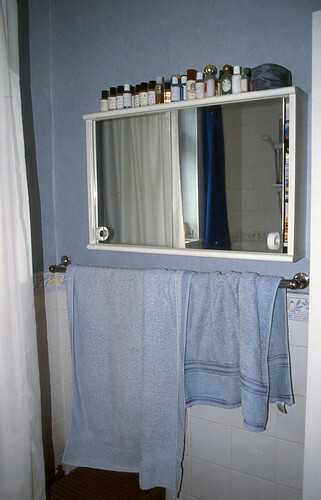 He moved systematically around each room photographing the entirety of their contents. When the pictures are arranged in the right sequence, it is possible to make a clockwise survey of all four walls. In their matter-of-fact recording of his everyday environment, the photos are unlike anything else in the archive, where certain visual themes and styles of image appear repeatedly. It may be that the pictures were taken for insurance purposes, though they were not filed with any relevant documents and they had become mixed up and perhaps lost in the mass of photos. 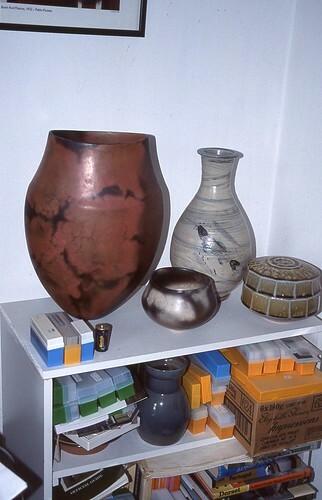 In their retirement years, my parents-in-law purchased ceramics, assembling a collection of hundreds of pots that ranged from insignificant pieces to substantial examples of ceramic art. Both of them made pots themselves and my father-in-law gave occasional lectures on the subject. He maintained a largely complete set of photos of the individual pieces they owned. Most of the house photographs also feature pots and it is possible that the pictures were taken, with some pride, as a record of how the collection was woven into the fabric of their lives. It often bemused us that the pots were so haphazardly displayed, negating (to our eyes) some of their qualities. Once or twice we suggested adapting a room to show off these treasures more fully, but the idea was never taken very seriously. It was oddly disquieting to stumble across the room pictures, one of those moments when an unexpected discovery hints at possibilities that lie outside your understanding of someone’s concerns or motivations. All of the pictures look cluttered. 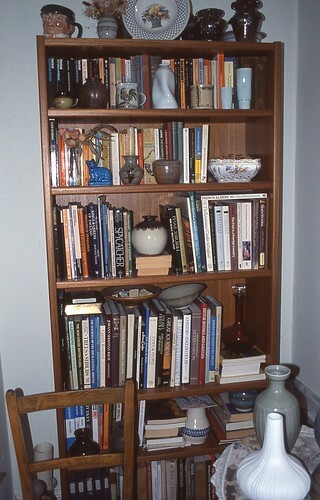 The pots fight for space with books, ornaments, CDs, box files, framed photos. Some of the pictures show only clutter. Why record humdrum scenes of papers piled on a sofa, jackets hanging on a picture rail and folded shirts on a bed, if the pots were the point? 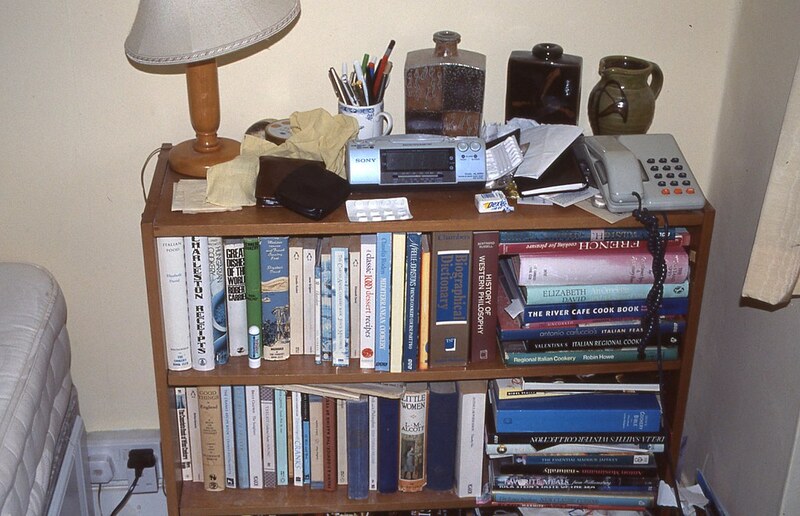 Do the pictures convey a trace of regret at this untidiness, a wish that things might still be ordered differently? There was no sign that my father-in-law wanted to make any great change. Did they represent a form of commemoration of the life the two of them lived in the house? Whatever they meant to him, these domestic still lifes comprise a self-contained project that stands apart from his other pictures. 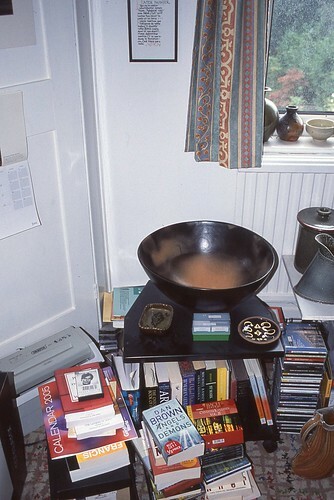 Thirteen years later, when he left us (his wife died in 2010), many of the objects in the photos had moved to other positions. But the house was essentially the same, a densely layered record of their lives that had to be dismantled and dispersed, as tenderly as we could manage, piece by piece. ‘Lost worlds’, Eye 55 article about found photography by Val Williams.